Atlantic Asset Management Conference, see website link. September 6-7, 2018, Moncton, NB. Simultaneous interpretation. September 28, 2018, Fredericton, NB. Simultaneous interpretation. 2. Series of Asset Management Awareness workshops - with partial funding from the Federation of Canadian Municipalities’ Municipal Asset Management Program (FCM). -Partnership of the Union of Municipalities of NB (UMNB) and the Association of Municipal Administrators of NB (AMANB) with the Atlantic Infrastructure Management (AIM) Network (https://www.aimnetwork.ca). In English: Saint John, October 23. Presenters from NB Powers, NB EMO, DELG Climate Change Secretariat, and our specialist Eddie Oldfield. See document produced: AMANB ETF Resiliency PLAYBOOK for New Brunswick Municipalities, March 2018. 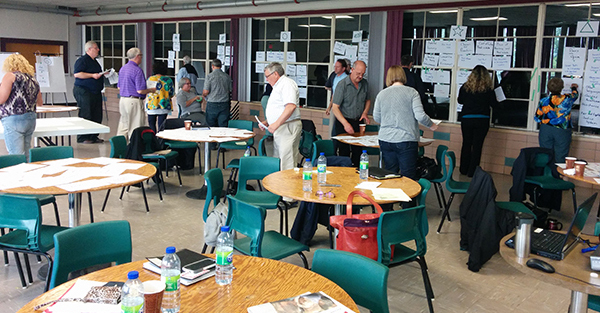 Situational Studies for thirteen municipalities of the RSC Acadian Peninsula using the ‘Building Sustainable Communities with Design’ approach. A municipal financial statement analysis and a technical sheet will allow interested municipalities to identify actions to move toward the sustainable path. The thirteen individual Power Point presentations are posted on the RSC website as well as on many participating municipalities websites. February 22-23, 2017, Fredericton Inn. View details here www.aimnetwork.ca/fredericton-conference . UMNB Annual Conference workshop: The public’s right to know and the Law, Presenter: Commissioner Anne E. Bertrand, Q.C., September 30, 2016, Fredericton, NB. Simultaneous interpretation available. A two-day English and French Development Officer Learning Event, March 30-31, 2016 in Fredericton. Half-day information session in French: Creating affordable housing through sustainable housing, October 29, 2015, Tracadie, presented in partnership with the Canada Mortgage and Housing Corporation (CMHC) and the Department of Environment and Local Government. Half-day information session in English: Creating affordable housing through sustainable housing, November 10, 2015, Miramichi, presented in partnership with the Canada Mortgage and Housing Corporation (CMHC) and the Department of Environment and Local Government. UMNB pre-conference workshop: Natural Gas 101: Be informed presented by Colleen Mitchell, President, Atlantica Centre for Energy, October 2, 2015, Fredericton, NB. In English with simultaneous interpretation. One day training in English: Digitization 101 – A Beginners Guide to Digitization, October 21, 2015, Fredericton. A two-hour presentation in French - Fiscal Impacts and Design: It’s more than dollars and cents, October 30, 2014, 7:00 p.m. to 9:00 p.m.at the Municipal Building of the Rural Community of Saint-André. See invitation for details. A two-hour presentation in English - Fiscal Impacts and Design: It’s more than dollars and cents, September 24, 2014, 9:30 a.m. to 1:30 p.m. at the Stella Maris Community Hall, Blacks Harbour. See invitation for details. ▪ UMNB pre-conference workshop: What is Strategic Planning and Why Should You Care, presented by Bonny Hoyt-Hallett, former Deputy Minister of Local Government, October 3, 2014, Saint Andrews, NB. Introduction session to the seminar Building Smarter Budgets with Design: Fiscal and social impact of smart growth, March 12, 2014, Moncton City Hall. Please see invitation for RSVP details.